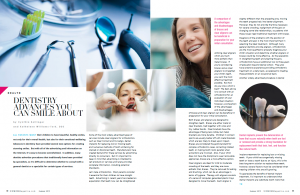 Dr. Kathelene Williams-Turk, a member of the Advisory Board of the Institute for Dental Implant Awareness (IDIA), authored an article on advances in dentistry for Northwest Mom Magazine. According to Dr. Williams-Turk, parents of children with missing teeth have numerous questions about the best method of tooth replacement. Dental implants are so widely advertised that many parents are interested in learning whether this is a viable treatment option for their children. There is relatively little information available regarding children and dental implants, so Dr. Williams-Turk decided to include this topic in the article, which she has provided for The Dental Implant Guide. Highlights from the article include the high success rates of dental implant treatment, the importance of proper diagnosis and treatment planning, and seeking the advice of a surgical specialist (Oral Surgeon or Periodontist), as well as a general dentist or Prosthodontist. Dr. Williams-Turk also stressed the importance of waiting until the growth of the jaws and face is complete before having dental implants placed. View Dr. Williams-Turk’s profile here. Download or read the full article by clicking on the image above.